Welcome to the Artistic Outpost Design Team November Blog Hop! Each month, the fabulous designers at Artistic Outpost showcase projects created with various Artistic Outpost Plates/Themes, this month it's "designers choice" which means the designers can use any Artistic Outpost plate. I created a mixed media card using images from the Artistic Outpost Cowgirl Strength plate and a quote from Quotes and Quotables. My panels are all created with monoprinting done with Stencils, acrylic paints and the Gelli Arts Printing Plate. 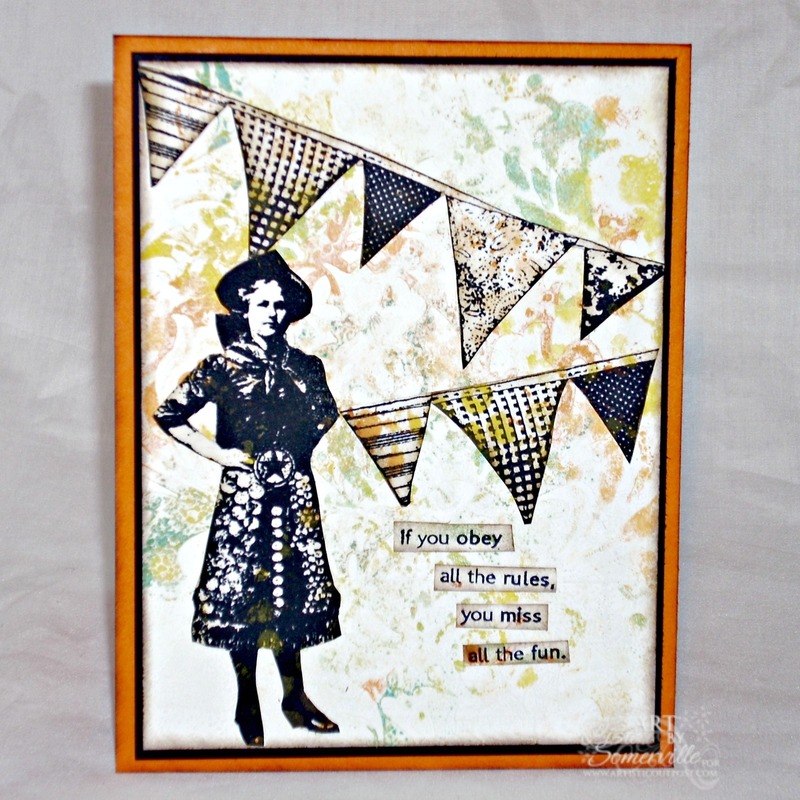 The cowgirl, pennants and sentiment are all stamped on scrap piece of the mono printing and adhered in place. For more Artistic Outpost inspiration, be sure to stop by the Designers Blogs for details on their projects! Great card; love your background. As always, a awesome background with your gelli plate. The colors are so subtle yet are the perfect compliment to your image. Lovely banner as well. So glad you were safe during the storm. Those pictures were very saddening. Praying for all your family & friends affected. Very cool, Lisa! Love the way your background came out and the flags are terrific too. The image and the sentiment work wonderful together! Glad to see you playin' with the Gelli, wonderful bg and love the card! Fabulous card, Lisa! That sentiment really fits that AO Cowgirl! Love the background and banner! Enjoy! Very nice card - I don´t have a gelli plate, but there are great effects coming out. I like the little banners. Great card there. Love the background. Will have to invest in one soon! Fabulous card and perfect sentiment for it! Beautiful Background! Love the banners. The card is fun with the image and words. Love it! Love all those amazing prints - and that's a brilliant quote! Fabulous mixed media card Lisa.